Jaas module to query the Bonita User Database, and return true if the login / password exist. This JAAS module is perfect if you want to use multiple JAAS module, and say "in Bonita OR in my LDAP"
in form V6, you have a "User Anonymous" function. You can setup a process with this properties, and then any person can create a case without a Bonita user/password. Actor filter to allow a task to a list of user candidates. Useful to allow users belonging to a group to be task candidates when the group depends on the process instance. What's about this specific code insides diagrams and web-pages ? How do I know the level of quality of this code ? How can I detect potential misconception, code smell or bug ? The Google filter can log you in the BonitaPortal is you are log in Google ! Or, a google button "Sign it" is present on the login page. 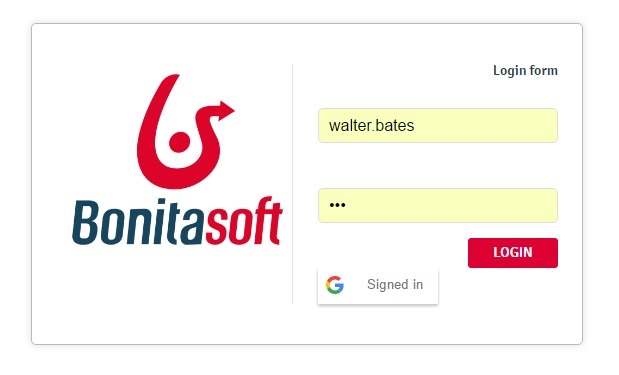 Click on, log in Google and you are log in Bonita Portal.